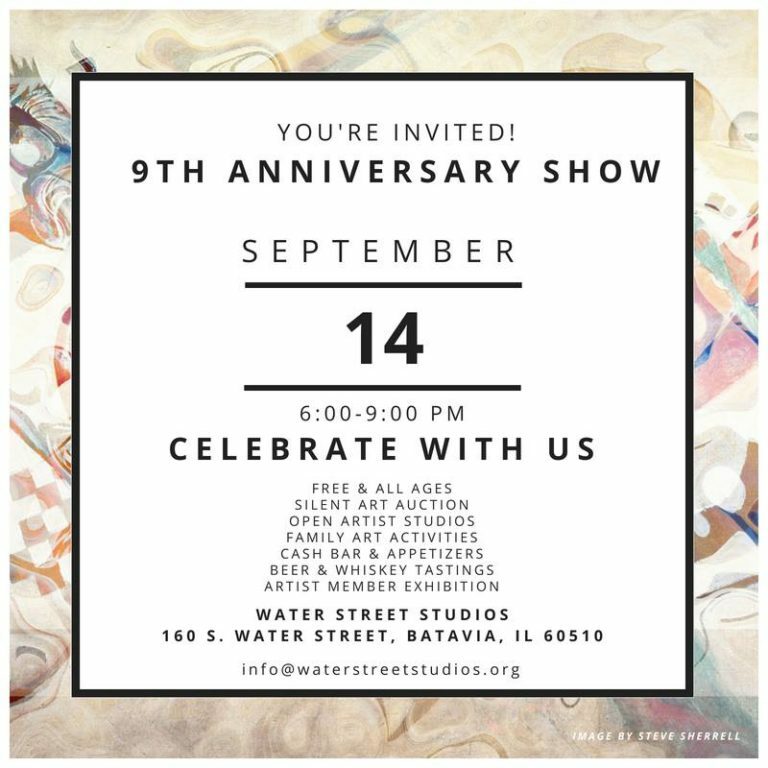 Join us for an evening to celebrate the Water Street Studios’ 9th Anniversary featuring a silent art auction, a beer and whiskey tastings provided by Solemn Oath Brewery and Whiskey Acres Distilling Co., open artist studios, new exhibitions, art activities, appetizers by Gaetano’s in Batavia, and a cash bar with beer, wine, and cocktail options. This event is for all ages and is free with a suggested donation of $5. The Dempsey Family Gallery will be displaying work created by our artist member community for its 9th Anniversary Show. The 2nd Floor Gallery will be displaying “Road Trip: Passage Through Collective Memory” by Christopher Cudworth. The Gallery Opening Reception and 9th Anniversary Celebration will take place on Friday, September 14 from 6:00-9:00 p.m. The exhibition will be up until October 7, 2018. Silent Art Auction—September 14th, opens at 8:00 a.m., closes at 8:00 p.m.
A wide range of artwork donated by artists affiliated with Water Street Studios will be auctioned off on September 14, 2018 starting at 8 a.m. Bid on your favorite painting, drawing, print, sculpture, glasswork, assemblage and more from morning to evening using your phone via the mobile auction platform 32auctions.com. Don’t miss your chance to get incredible deal on one of your favorite pieces of art and help us reach our goal of raising $5,000 to support arts programming in the Fox Valley region and beyond. Artwork will be available to view online starting Wednesday, September 12th. The auctioned work will be on display in the Loading Dock adjacent to Water Street Studios during the regularly scheduled monthly Gallery Opening Reception on September 14th from 6-9 p.m. Winning bidders will be able to go home with their new original artwork on Friday, September 14th at 8 p.m. Stay tuned for more information and instructions on how to participate. Opening reception will be held September 14, from 6 – 9 p.m. The show will be on view during regular gallery hours: Friday, 2-6 p.m.; and Saturday and Sunday, 12-4 p.m. at 160 S. Water Street in Batavia, IL. The front entrance to Water Street Studios is located in the alley south of Water Street. Parking is available on Water Street or in parking lots located on First Street. Water Street Studios is a nonprofit art center located in Batavia, Illinois. Our mission is to help make the arts more accessible to the Fox Valley region and beyond. Our vision is to be a cultural hub in the Midwest. We provide our ever-growing community with art classes, artist studios, community events, gallery exhibitions, free after-school art programs, outreach, private events in a historic venue, and more. For more information visit www.waterstreetstudios.org. Become a member today. Want to submit your artwork for this exhibition?